The first card I made for a little girl. 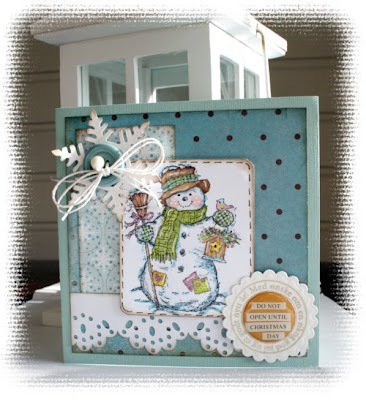 The other card is with my favorite stamp, the Snowman I love to color him in different colors. Over at the http://sugarbowlblog.blogspot.com/ they have a sketch challenge with a wonderful price for the winner. Here is my card made with Tiets`sketch. I have made a card for Christmas. Thanks for visiting. Here is my brown card for the Stamp something challenge. I have used this cute stamp, and I have colored it with promaker pens. Hope you like it. Thanks for visiting. Here is my favorite stamp right now. 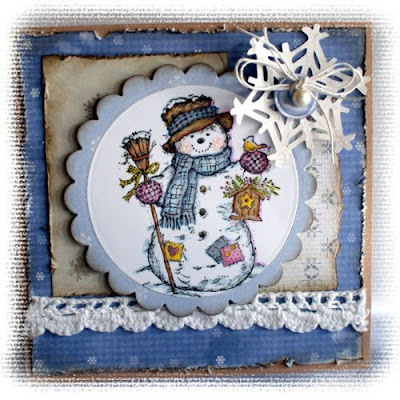 The snowman is so wonderful, and I love to color him in different colors. I have used my promakers as usual. I love to use buttons to spice up my cards. I think they look great together with a snowflake and some tread. Thanks for visiting. Ukas utfordring på Sukkersøttbloggen er å bruke søm og stoff på kortet. Jeg har sydd fast for hånd en bit med linstoff. Hjertet i "gull" har jeg laget selv. Jeg har brukt papirer fra Ladybug and Friends. Stempeltrykket har jeg fargelagt med Promaker tusjer. Rammen rund stemplet har jeg designet med craft robo maskina. I have made some jewelry, it is no silver and it is no gold, but I had a lot of fun making them. Thanks for dropping by. Here are two small pictures that I have made recently. Thanks for stopping by, I will be happy if you leave me a word or two just to say that you were here.